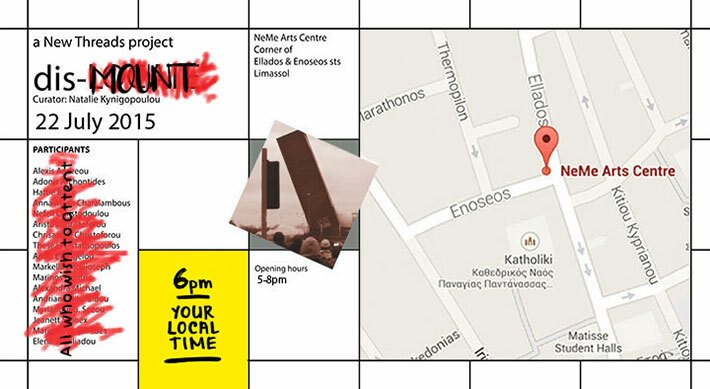 Responding to an invitation by “LINK Center for the Arts of the Information Age” NeMe’s participation in “6pm your local time” Europe-wide event on 22 July 2015 is a specially organised happening conceived by Natalie Kynigopoulou which questions and extends the way exhibitions are perceived by the public, not only as a carefully installed dialogue between artworks but also as a process which eventually results in the exhibition’s own private demise – consisting of the dismantling, packaging and return of the artworks to their respective owners, thus re-subjecting the space into an introverted silence. The vital and creative process of mounting a show is normally occurring behind closed doors and is now recognised as an inherent part of the exhibition whereas unmounting a show is certainly always ignored. In order to expand the scope of what should be observable, NeMe is opening its doors to the complete actuality of the dis-LOCATE exhibition which raised questions about the process of art-making and extends those to the exhibition’s organisation as an open art-process in an attempt to redefine the approach to how art is observed. Photograph on the web-banner is by Martin Pearman and is taken on Sunday, 15 January, 2012 moments after the demolition detonation of Campbell’s soup tower in King’s Lynn, Norfolk.